The 3D Printing revolution has started. 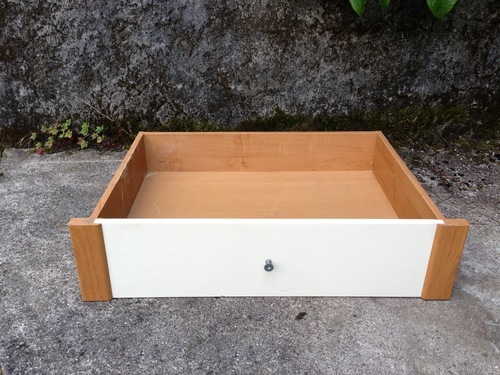 It will change the way we think, design, manufacture, distribute and use products. Thanks to open-source 3D printer projects shared on-line (see: www.reprap.org) it finally became affordable for people to build their own and share knowledge and experiences about it. 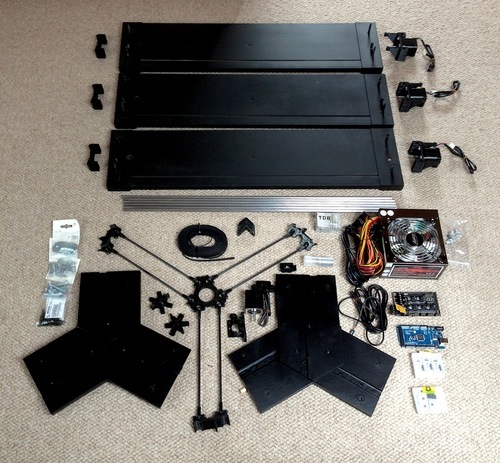 I couldn’t resist on building my own 3D printer! I had to. So last summer I did and it was one of the biggest satisfactions I had in my entire life. I feel proud of having put together a machine, that is capable of building, with quite a high level of precision, other products or even other machines. 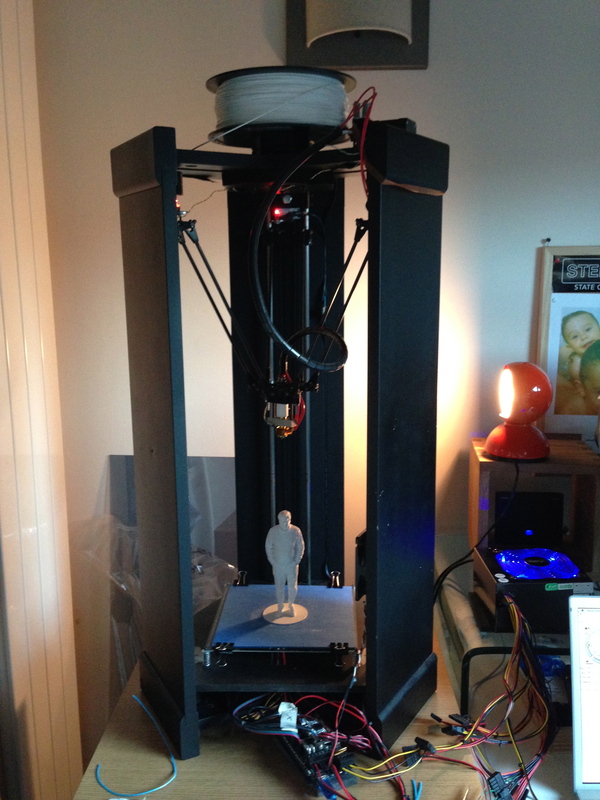 I’ve decided to share my 3D printing experience on this blog and give support to people who want to build their printers or simply want to know more about 3D printing. 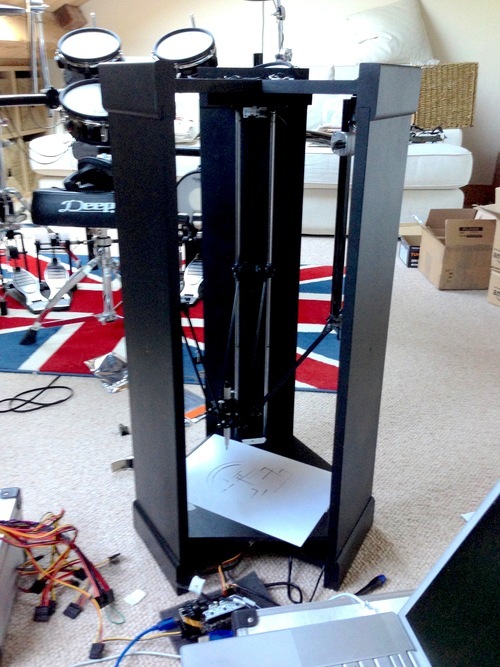 My machine is a custom Rostock 3D printer. 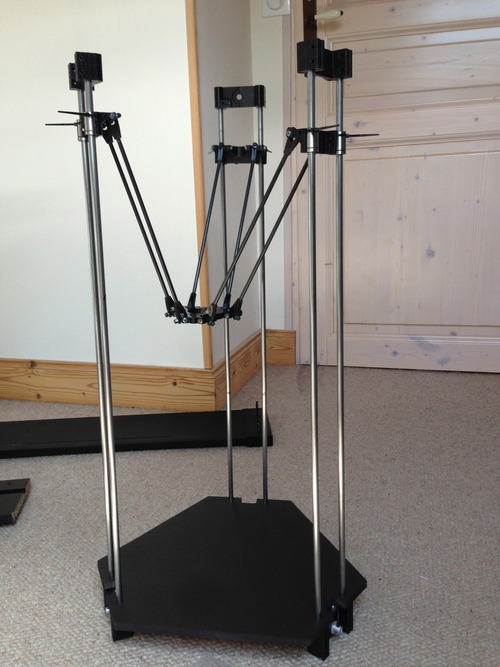 It’s a so called Delta Printer because instead of having 3 orthogonal axis ( X, Y, Z ), like most printers, it has instead 3 vertical columns, forming a delta shape from the top. Delta printers can normally print faster and bigger, but what made me fall in love with the Delta 3D Printer concept in first place was the fact that they are so beautiful to see operating. We can say they are more robots than normal 3D printers. I’ve also found an inner conceptual beauty in it, the way the 3 carriages vertical movement is translated into a three dimensional movement for the hot end is simply amazing. 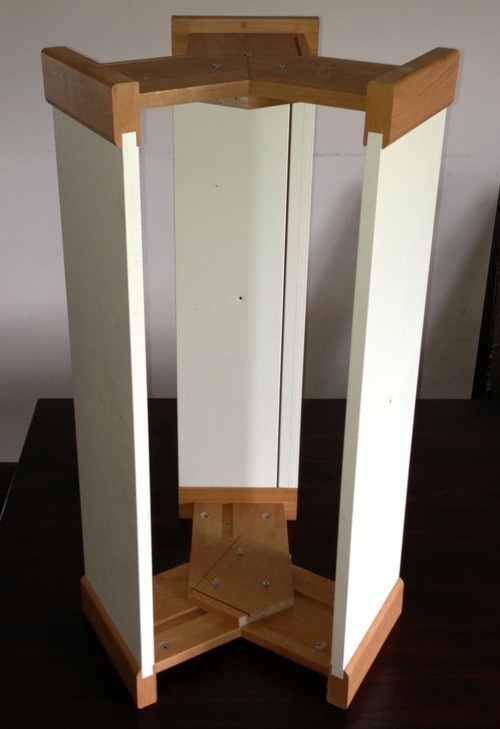 The Rostock 3D printer main project was originally developed by Johann Rocholl, I followed his instructions and implemented the project with an outer structure made with some spares Ikea closet I had in my cellar. 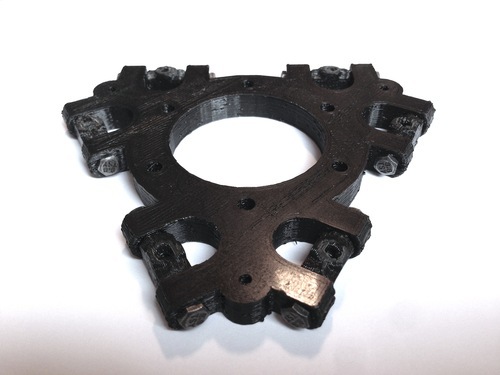 I knew that one of the weak point of Rostock printers was structural rigidity and stability and I think I my idea helped a lot to fix this problem. 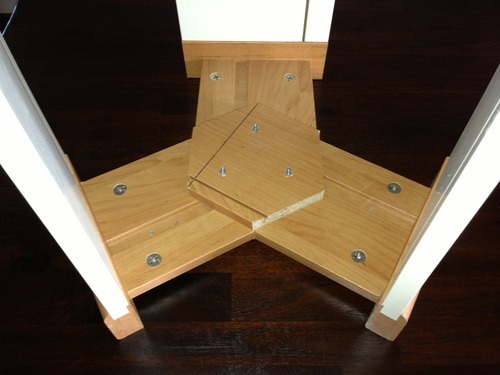 The first step was to measure, cut the 3 closets and join them with M4 screws in order to obtain the outer structure I could place all the other components in. I’ve decided to keep the original closet fixings screws accessible in order to being able to take all the pieces apart if needed later on. In fact I suddenly realised I wanted to cover the original materials with a matte black paint. So I took all the pieces apart and starting the paint job. I was quite happy with the result and decided to get as many components as possible in black in order to keep a dark techno look and try to give the machine a strong visual impact. The next step was getting all the other components. 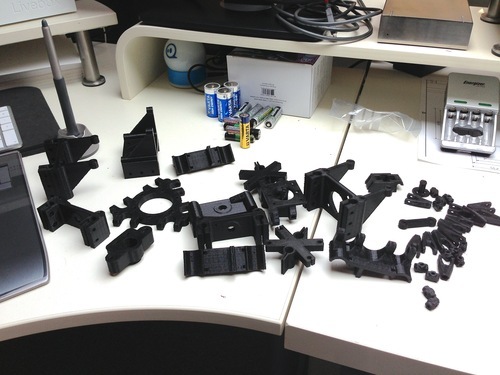 Most of all the plastic parts which are normally 3D printed. I’ve found on e-bay a good deal for a complete set of black Rostock plastic parts printed in Spain. They looked good at first glance, but then I had to do quite a lot of manual adjustments to it, especially on the end effector platform which is the most important component of delta 3D printers. Placing the M3 nuts in place was easy after heating them up with the soldering iron, but I had to struggle a bit for being sure that the 6 small plastic joints were tight enough and still easy to rotate. 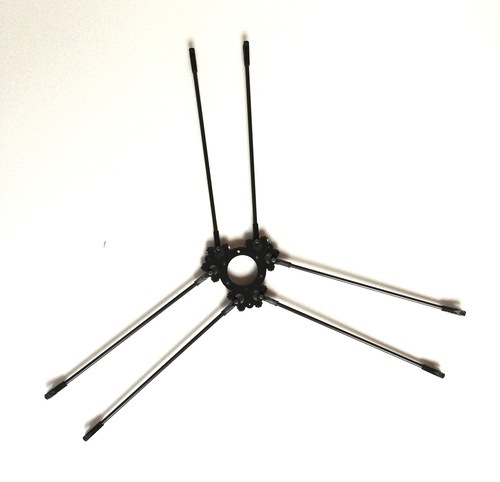 I’ve built the diagonal rods using a few carbon arrows found at Decathlon! They already had the right diameter (5mm) but I had to cut them in lenght before gluing the joints. 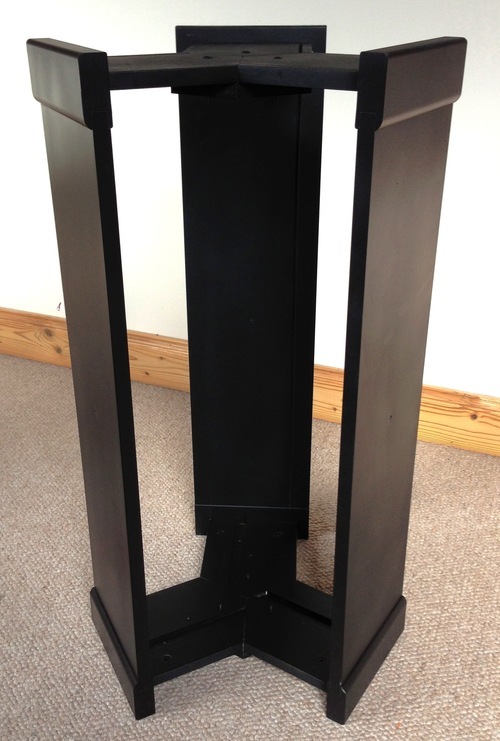 Then I finally assembled the end effector platform to the diagonal rods. II didn’t know at the beginning how important was to get this components perfectly assembled, but fortunately I’ve put as much attention and precision as possible in it. In the meantime I had ordered all the other components except for the hot end, the extruder and the heated bed that arrived later on together with the first ABS filament spool. 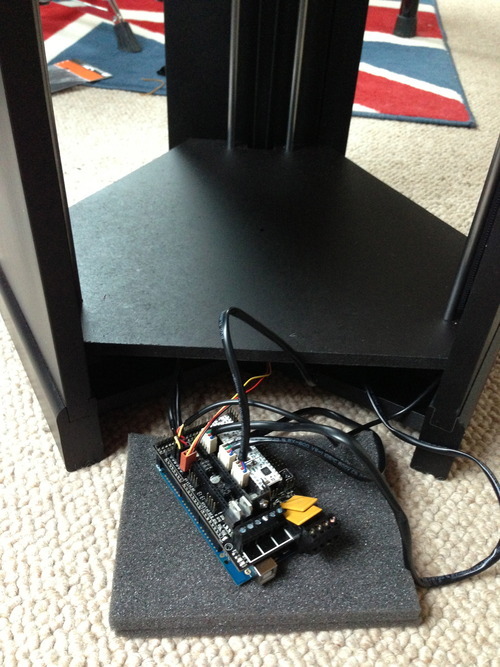 The electronic is a RAMPS 1.4 mounted on a Arduino Mega. I got a complete set of already assembled electronics with end stops and cables. The power supply is a normal computer ATX. 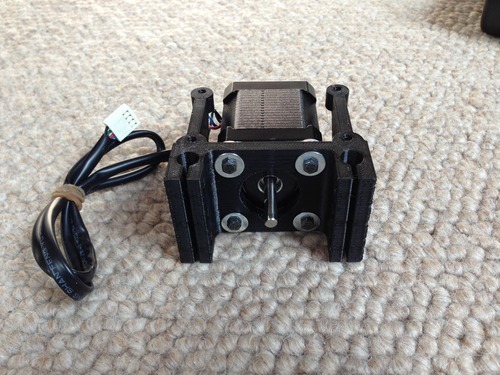 The 4 Nema17 electric motors (3 for the vertical axes and 1 for the extruder) were already assembled with a cable and with the right connector so I simply had to fix them to the plastic platforms with M3 screws and washers. 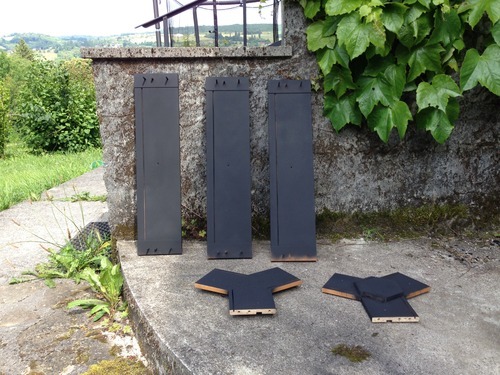 Then I was ready to put them in the wooden structure and place a black painted MDF platform on top. This time I’ve chosen a heat proof black paint considering that the heated bed had to go exactly on top of it. In the picture the pulley is already in place, ready to couple with the belts that will allow the vertical carriages to slide along the two 8mm metal rods. Each carriage run smoothly on the metal rods thanks to 2 LM8UU linear bearings firmly attached to it with plastic fasteners. 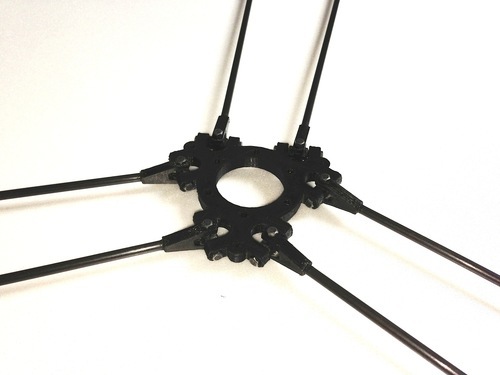 On top of the metal rods you can see the idler end plastic component. The hole in it allow to insert an M8 screw to fix a 608ZZ skateboard ball bearing. 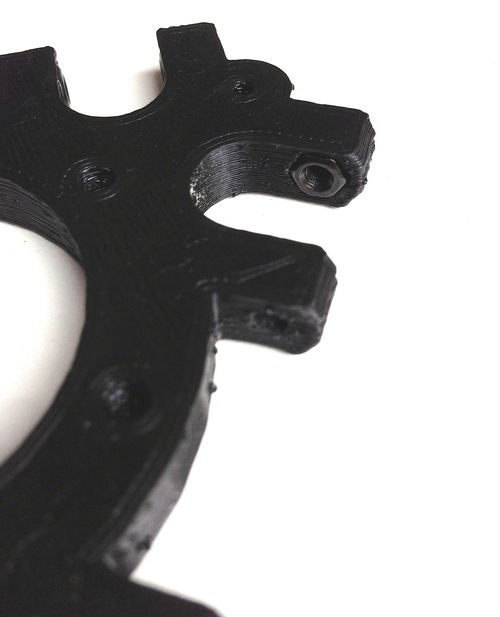 The timing belts connect this point to the lower motor pulley and this is what allow the vertical carriages to move. I didn’t make any picture of the belt positioning, I think it was a tough moment and I forgot it. It was quite hard to find a way to give the belts the right tension. 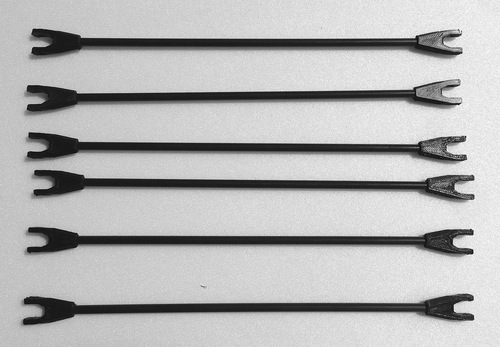 The end stops provides an electronic signal to the software and allow the carriages to find their home position at the top of the metal rods. 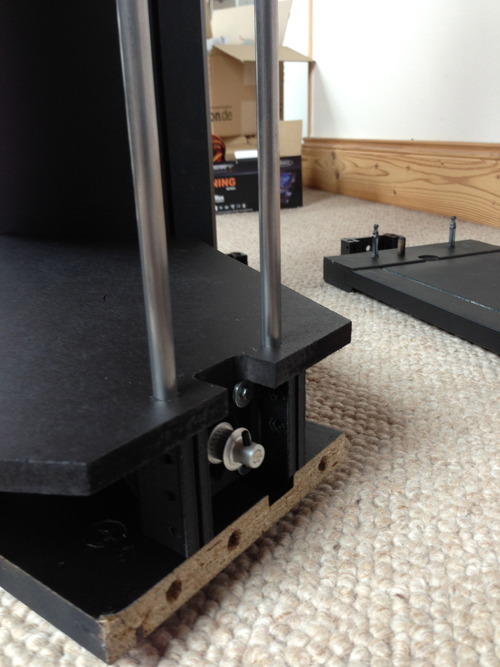 A small M3 screw allow the carriages height fine tuning, very important during the calibration process. After connecting motors and end stops to the RAMPS electronics I could finally connect the ATX power supply, my laptop to the electronics through a USB cable and download the Marlin software to finally run a test and see the motors turning. It was a VERY special moment. Things didn’t go well right at the beginning, but after a few try everything worked as expected. In the picture a pen is mounted instead of the hot end in order to test the motors directions and start the basic calibration. At this stage my 3D printer could perfectly work as a plotter ! Assembling the extruder was the next step. 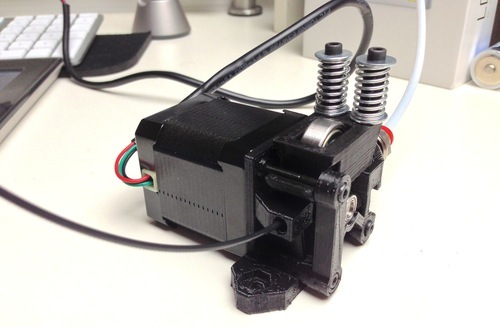 The Airtripper’s Bowden Extruder uses a NEMA17 electric motor to push the plastic filament into the white Teflon tube that goes directly to the hot end. 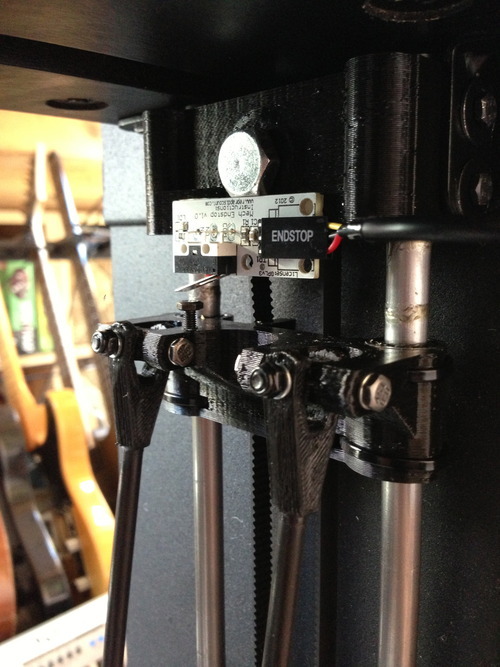 This way the extruder doesn’t have to be attached to the end effector platform allowing higher printing speed. But at the same time some latencies can occur and this is a problem that all Delta Printers have to cope with. 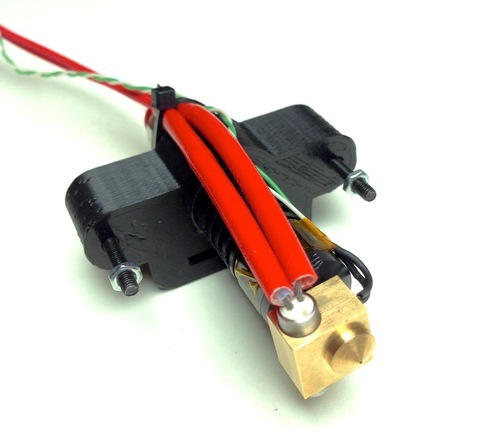 The hot end is what allow the plastic filament to melt inside the copper heating block that is heated through the electricity coming from the two red wires. Temperature is controlled by the sensor connected to the white-green wires. The very last component to assemble was the heated bed. It allow the plastic to stick to the glass plate avoidng deformations during prints. A special heat resistant tape protect the glass from being scratched and provides more grip to plastic. 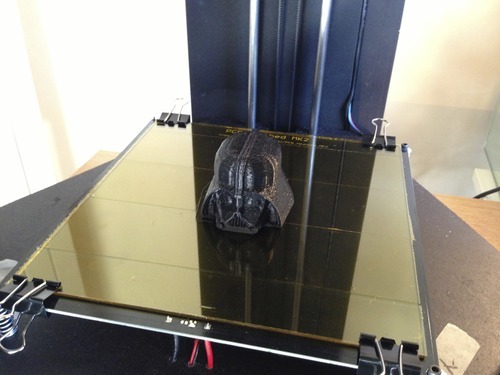 The Giant Lego Darth Vader Head was one of the first things I printed out. In the picture you can see a very low resolution test. But before being able to find the right settings I had printed hundreds of cubes and calibration shapes. 3D printing is still an experimental field and if you want to build your own printer you have to take in account that you need a lot of commitment and focus. But efforts will surely be compensated with a great satisfaction. Being able to think, design and create things directly on our desk is something that will lead us to a new era where customisation, sustainability and creativity will be the magic words ! If you want to know more about my 3D printing creations and future developments follow this blog and feel free to contact me anytime. I read this article and found it very interesting, thought it might be something for you. 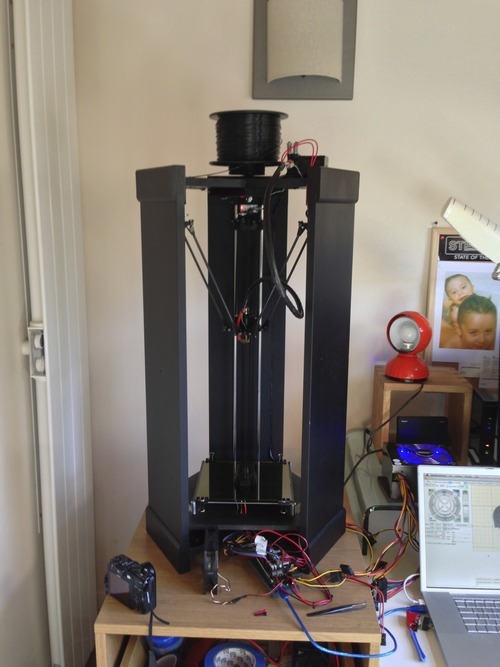 The article is called Making the custom Rostock 3D printer and is located at http://turicacciatore.com/3d-printer-project/.